These burgers are delicious and easy to make. They are also a great way to cut down on the amount of meat consumed in a family meal. At our house we usually eat “deconstructed burgers” to keep them gluten free, but gf burger buns are also becoming readily available at the grocery store in the frozen food section. In a large bowl, combine all of the ingredients except the olive oil. In a large sauté pan, heat half of the oil over medium heat. 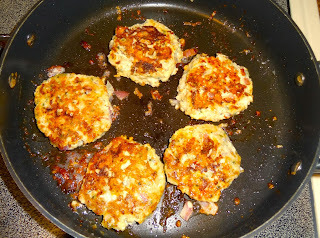 Form the meat into quarter pound patties and cook them for five minutes on each side, or until they are golden brown. After the first batch has cooked, add the rest of the olive oil to the pan and cook the second batch. I made nine burgers with this recipe. Serve your burgers with your favorite toppings. Enjoy!